What are the Stainless Steel Crowns? 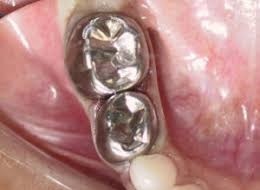 Stainless steel crowns are prefabricated crowns that are used on baby teeth. It is commonly used to fit over a primary tooth that been prepared to fit on it. The crown covers the entire tooth and protects it from further decay. When the primary tooth comes out to make room for the permanent tooth, the crown comes out naturally with it. In general, when the primary teeth need crowns, the stainless steel crowns are used for they don’t require multiple dental visits and are less cost- effective than the custom-made crowns. In such cases, the Dentist likely recommend doing what is known as a stainless steel crown.